This new P80/C is inspired by the 330 P3/P4 and 1966 Dino 206 S. Ferrari claims it to be their ‘most extreme one-off design ever’. What would you do when you have more money than you can count? Most automobile enthusiasts would get themselves a red car with the Prancing Horse insignia and a few others of similar standing. But some tasteful enthusiasts would ask Ferrari to build a one-off car exactly the way they’d want it to be. This is the story of the Ferrari P80/C. While Ferrari took the wraps off the new, one-off P80/C today, the client in question was of course not disclosed. But if you have landed on this page, then like us, you are probably more interested in the car than the client. As per the client’s brief, the P80/C gets its inspiration from the 330 P3/P4 and the 1966 Dino 206 S. In fact, it even gets the concave rear windscreen as a tribute to the 330 P3/P4. The ‘sports prototype’ has been in the works since 2015. Based on the same platform as the 488 GT3, the P80/C is a purely for track use – notice the absence of headlight, super low stance and the large wing at the back? 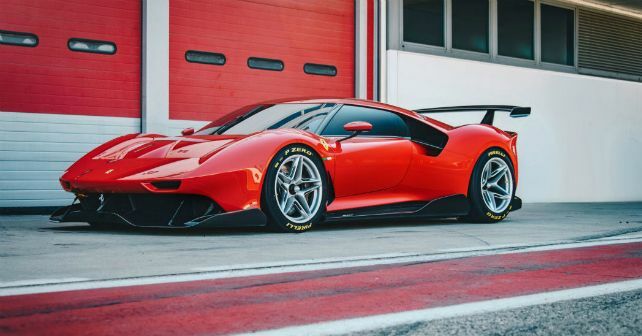 Ferrari claims that the wheelbase of the P80/C is larger than the 488 allowing them a little more freedom in terms of design. Inside, the P80/C remains largely identical to the donor car – it even gets a roll cage integrated into the bodywork. The side sections of the dash, seat upholstery and the door panels have been redesigned from the 488 GT3. While there’s no confirmation about the specs, it’s safe to assume that it comes with a 3.9-litre twin-turbo V8 that pushes out about 600 horses. It took the brand four years of hard work at the Ferrari Styling Centre under the direction of Flavio Manzoni and the engineering and aerodynamics team to develop something as unique and authentic as the P80/C.